This article develops insights and generates new lines of inquiry into young children’s digital lives in China and Australia. It brings to dialogue findings from a national study of young children's digital media use in urban settings in China with findings from studies in Australia. This is not presented as a direct comparison, but rather as an opportunity to shed light on children’s digital lives in two countries and to account for the impact of context in relatively different social and cultural circumstances. The article outlines findings from a study of 1,171 preschool-aged children (3 to 7-year-olds) in six provinces in China, including the frequency of their use of television, early education digital devices, computers, tablet computers and smartphones, music players, e-readers and games consoles. It also focuses on various activities such as watching cartoons, using educational apps, playing games and participating in video chat. Methods included a multistage sampling process, random selection of kindergartens, a weighted sampling process, the generation of descriptive data and the use of linear regression analysis, and a chi-square test. The study demonstrates the significance of a range of factors that influence the amount of time spent with digital media. The contrast with Australian studies produces new insights and generates new research questions. Young children’s digital practices present parents, educators and policymakers with a significant social challenge, but remain under-researched. This article outlines findings from a study of the digital practices of 1,171 preschool-aged students (3 to 7-year-olds) in China, and these findings are then considered dialogically with findings of available studies in Australia. We do not present this as a scientific comparison, but rather as an opportunity to provide context to understand the data from China and to develop new research questions. This approach has proved valuable to us as scholars conducting research in China and Australia because it sheds light on children’s digital lives in different social and cultural circumstances. The article presents a literature review before outlining the data from China in detail. It then provides some findings from available Australian studies. Our approach draws on Bakhtin’s theory of dialogism (1984) to suggest that understanding local data is enhanced by discussing findings from other contexts. Our approach has limitations because while the data from China was gathered and analysed by the lead author, the Australian findings are from a small number of limited secondary source studies. Despite this limitation, the article generates interesting propositions about young children’s digital lives in China. Children’s digital experiences have emerged as a worldwide issue not only because screen media has become an everyday part of many children’s lives, but because digital lives begin at ever younger ages (Holloway, Sefton-Green, & Livingstone, 2013). Data from EU Kids Online indicates an increase in young children’s Internet use in recent years. In some countries, for example, Sweden, Belgium and the Netherlands, almost 70% of students aged 3 to 4 go online (Holloway, Sefton-Green, & Livingstone, 2013). Mobile devices, especially touchscreen media, provide young children with easier digital access than was previously available (Thorpe & al., 2015; Marsh & al., 2016). In the United States, the percentage of young children’s mobile device use increased sharply from 38% to 72% in just two years from 2011 to 2013, reflecting the introduction of tablet computers (Common Sense Media, 2011, 2013). The rapid uptake of digital technologies by young children is not just a Western phenomenon. In China, there were more than 1.18 million children aged from 6 to 11 using the Internet in 2015, particularly via smartphones (CNNIC, 2016). Research conducted in China shows that although television still dominates young children’s screen time, touch screen media is available in almost every household (Li & Wang, 2014; Yu, 2016; Yang, Wang, & Zhu, 2016). These significant changes have caused concern in China. A sample survey in Nanchang, Jiangxi Province (Yu, 2016) indicates 51% of parents of young children hold negative attitudes towards touchscreen media, with concerns about vision health, social interaction and Internet addiction. Research shows that youngsters have always been seen as more vulnerable to media and technologies than older children (Paik & Comstock, 1994; Ostrov, Gentile, & Mullins, 2013; Radesky & al., 2016). However, there is perhaps more concern about children’s digital media use than is warranted. For instance, reporting on a survey conducted in Beijing, Li & Wang (2014) argue young children’s lives have not been overly occupied by digital media. They found that children’s daily total time for playing with toys, outdoor activities, and reading is 2.5 times greater than engagement with media. Along with China’s fast-paced economic development, people in China are living through significant social changes, including changes to childhood contexts. The one-child policy has changed since 2013, potentially altering the family structure (Chen & al., 2016). Furthermore, fierce labor market competition reinforces parents’ pressure and leads them to privilege their children’s education (Chi, Qian, & Wu, 2012; Chen, 2015). These authors suggest early education starts from the moment a baby is born, with significant uptake of educational toys and early education curricula which potentially impacts Chinese young children’s education, entertainment, and parenting. Meanwhile, there has been limited research on the impact of socio-economic demography on young children’s digital media use in China, which is of concern, given significant disparities in household income in China. As scholars have argued, to effectively understand children’s media use, it should be located within familial, economic and geographic contexts (Jordan, 2016; Calvert & Wilson, 2008). In one Chinese study, Li, Zhou and Wu (2014) investigated media use of 1,195 infants aged between 3 to 6 in Ningbo, Zhejiang province and found that time spent on television is associated with children’s age, family income and parents’ education. Li, Zhou and Wu (2014) suggest that minors from lower income families or families where parents have less formal education tend to watch more television. Meanwhile, children living with grandparents or those from higher-income families spend more time playing video games. These results are in accord with those found by Western scholars (Huston & al., 1999; Anand & Krosnick, 2005). Overall, though research about young children’s digital lives in different socioeconomic situations is still limited in China and internationally. China is a developing country with unbalanced economic development, and children’s media use is likely different across regions. However, no large national survey has ever been conducted. Secondly, the amount of research related to this topic is sparse in China, and most studies simply provide descriptive data. Thirdly, it is difficult to find data on Chinese young children’s digital media use in English, which hinders international scholars from understanding the situation in China, or making comparisons to Western data. Therefore, this research draws a national picture of young children’s digital media use at home in urban China. The first question focuses on the kinds of digital media children access at home since household ownership of digital media reflects values, requirements, and preferences of each family. Questions about usage patterns and predictors provide a general understanding of young children’s digital media behavior and disparities between different demographic variables. We also ask how parents in China value different kinds of digital media and what rules they have for children’s usage as it has been shown that young children’s media exposure is strongly related to parents’ mediation strategies (Wu & al., 2014; Nikken & Schols, 2015). These data provide a better understanding of digital childhoods in China; placing them in dialogue with available studies from Australia enables preliminary discussion about similarities and differences between the East and West in the context of the globalized media industries. Data about 1,171 preschoolers’ (aged 3 to 7) media use was collected in China by the lead author through a parent-report questionnaire from April 2017 to June 2017. A multistage sampling process was conducted in mainland China. Initially, 27 provinces were clustered into three categories according to indicators reflecting the regional economic development and education quality, which include GDP, education funding, number of kindergartens, teacher and student ratio. Four municipalities (Beijing, Shanghai, Tianjin and Chongqing) directly under the Central Government were excluded due to incomparable population and level of development. This stratification provides a better representation of diversities in economics, education, and geography. Next, six provinces were chosen randomly in each category, and the best-developed city was chosen since access to kindergartens was more possible in those cities. Lastly, a random kindergarten was chosen in each city and questionnaires were sent to all the preschoolers and completed by one of each child’s primary caregivers. The overall response rate is as high at 78%, as teachers in every class asked parents for help to support the study. Table 1 shows the sampling result in each city. As the number of students and response rate differ in each kindergarten, a weighted sample according to preschooler population size in each region was used to achieve a more reliable representation. To understand the digital lives of Chinese young children, descriptive data such as average time spent and frequency of media usage were represented. A linear regression analysis was conducted to explore important predictors of time spent on different kinds of media, and a chi-square test was used to see how parents’ attitudes toward different media vary among different social-economic status groups. Australian studies discussed include the longitudinal study of Australian children (AIFS, 2016), and studies on children’s television viewing (ACMA, 2015), young children’s mobile touchscreen media use (Coenen & al., 2015), and parents’ beliefs about their young children’s screen time and physical activities (Hamilton & al., 2015). The findings from these studies are placed into dialogue with the findings from China to provide a deeper understanding of the Chinese data. Bakhtin’s dialogic approach (1984) suggests acts of interpretation are inevitably relational and productive where they recognise opportunities for dynamic interaction of concepts and ideas. He suggests dialogic relationships are an almost universal phenomenon, permeating all human speech and all relationships and manifestations of human life, everything that has meaning and significance’ (Bakhtin, 1984: 40). We have been inspired by this line of thinking in our interpretation of findings from the Chinese data, not just to gain greater insight into the Chinese data, but to generate new questions about young children’s use of digital media in different social and cultural contexts. Young children in urban China are surrounded by digital media at home. In a typical family, there are 1.42 televisions1, 0.69 early educational tablets2, 0.70 desk computers, 1 laptop, 0.83 tablets, 2.96 smartphones, 0.5 music players, 0.17 e-readers and 0.15 game consoles. 93.2% of families own at least one computer (pc or laptop), 65.9% of them have tablets, and 52.1% bought early educational tablets for their child. Only 3.6% of families have no television while the percentage of families without any e-reader or game console is high at 84.8% and 90% respectively. Table 2 shows average time spent on each kind of digital media when asked about media consumption for the previous day. Over 99% of infants use at least one digital device on both weekdays and weekends and the average total screen time is 63 minutes and 88 minutes respectively. 14.2% of children exceed 2 hours’ total screen time on weekdays while 26.7% exceed 2 hours per day on weekends. Television is the most frequently used, followed by smartphones, tablets and early educational tablets. Although a large proportion of kids in the study never use early educational tablets (46.9%), computers (47%), tablets (39.4%), and especially game consoles (91%), only 9.7% never use smartphones. Table 2 also indicates that tablets and smartphones are the most popular and most often used mobile devices for young children. When a tablet is available for infants, they spend more time on it than other media, except for television. Table 3 shows minors mostly watch children’s television programs and cartoons on tablets and smartphones. Youku, iQiyi and Tencent Video are their favorite video apps, as listed by parents. Nearly half of young children (47.9%) play games on tablets while 38.2% play games on smartphones. The most popular games among kids are Talking Tom, Carrot Fantasy, Pop Star and girls’ dressing games. Several games listed by parents might be considered by other parents as inappropriate for the age group, including Plants vs. Zombies and King of Glory. Parents identify the use of educational apps more often than other categories of apps. For instance, «Jiliguala» for learning English, «Wukong Shizi» for learning Chinese, «My numbers» for numeracy, video apps such as «Himalayas» to listen to stories, and there are also some integrated early educational apps combining cartoons, gaming, singing and ‘common sense’ education, such as «Baby Bus», «Xiao Banlong» and «Shima Shima Tora no Shimajiro» (from Japan). Tablets are used more often than smartphones for accessing educational apps (44.4% compared to 28.5%). However, 41.5% use smartphones to make phone calls or video chat. WeChat, the most popular social media in China, is listed by some parents as young children’s favorite app. Another aspect of digital media use investigated were the factors influencing the amount of time spent with digital media. Table 4 shows the linear regression analysis result of the main time factors. Here we consider four potential reasons: (1) Children’s demographic variables like gender (1=boy, 0=girl) and age (months). (2) Family socioeconomic status such as parents’ education and yearly family income. (3) Family structure including sibling presence (1=yes, 0=no) and whether the child is mainly taken care of by parents or grandparents (1=parents, 0=grandparents), and (4) Region (1=Shanghai, 0=other regions). Gender and age do not have much influence on young children’s screen time. However, older children are likely to spend more time on computers than younger children. Young children whose mothers have higher degrees spend less time on television, early educational tablets and smartphones. Total screen time also decreases with higher education, although fathers’ education seems to have little effect. Family income is significantly related to how much digital media a family accesses (r=0.327, p<.001), which means that young children from higher-income families may have more access to different digital media. Time spent on digital media does not have any association with family income, though, except for television. 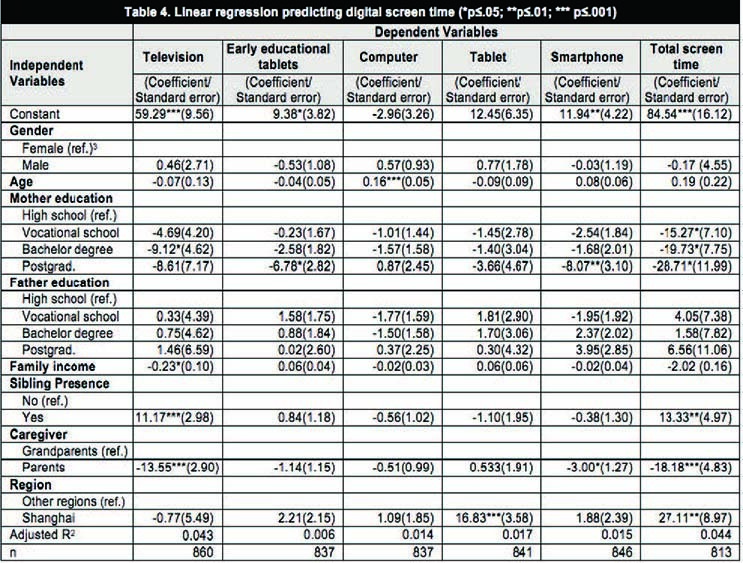 These results indicate that mother’s education and, to some extent, family income are predictors of screen time use. Sibling presence is an important variable in relation to screen time on television. Since 35.4% parents claim that they might use media as a babysitter because they do not have enough time to take care of their children, raising more children may lead to lack of time. In addition, compared with other media, television is more appropriate for siblings to watch together while other media are usually used alone. In China, 64.4% of young children are taken care of by parents while 33% are cared for by grandparents. A very small proportion of young children are raised by nannies (0.5%) or other people (1.9%). As shown in Table 4, time spent on television and smartphones increases if grandparents take the child care. The chi-square test found that parents are more likely to set strict rules than grandparents for smartphone use (?2=9.98, df=3, p=0.019) which may lead to young children’s moderate use. In this research, different regions relate to the difference in economic development and investment in education. However, large disparities are only found between Shanghai and other regions. In Shanghai, one of the best-developed cities in China, young children tend to spend more time on new technology like tablets. The average time spent on tablets in Shanghai (24.9 min) is more than twice compared with other districts (9.8 min). Furthermore, as shown in Table 4, time spent on tablets is not determined by family income, but by region, which indicates that parents in developed districts may have more open attitudes toward new technologies. Table 5 represents young children’s average time spent on non-digital activities. In China, large numbers of preschoolers spend their whole day in kindergarten. The average school time on weekdays can be as long as 7 hours 23 minutes, 5 days a week. Breakfast, lunch, and dinner are all included in kindergarten time. 46.6% of children take on after-school training like English, Maths, dancing, musical instruments and other activities. On weekends they spend nearly an hour on outdoor activities and with toys, which implies that young children in China undertake significant physical activities. Worries about excessive screen media taking up recommended physical time may be overstated for most Chinese young children. The data indicate that parents act as gatekeepers in young children’s digital media use. 82.5% say they download apps for their children and 86.5% check the quality of apps before allowing their children to use them. However, using digital media as babysitters is sometimes inevitable due to lack of time or the need to occupy or distract small children in public places. Only 38.1% of parents state that they seldom or never leave their baby alone with media. Thus, parents make rules for children’s media use which also reflect their attitude towards different digital media. Parents believe digital media can be both helpful and harmful to young children. Smartphones and game consoles are blamed for causing harm by most parents while early educational tablets are more valued (see supplementary table at https://bit.ly/2xn5gYE). Chinese parents tend to pay attention to the educational function of media, while the role of entertainment is less important. Therefore, they make rules for media content and time spent with television, computers, tablets, and smartphones, but there are fewer rules about using early educational tablets. Demographic variables like parents’ education, family income, and region are important indicators of parents’ opinion on digital media. Respondents with higher incomes and higher degrees or those from more developed regions are more likely to hold positive attitudes towards tablets and smartphones. However, as shown in Table 6, parents with less education are more likely to believe in the educational value of early educational tablets (mother: p<.01, father: p<.01). Children whose parents achieve higher degrees are more likely to be nonusers of early educational tablets. As noted, there is only a small amount of data about young Australian children’s use of digital media at home. The best available data is from the Longitudinal Study of Australian Children, which outlines screen time use and parental attitudes for a cohort of several thousand children, but the study is limited because the cohort was aged 4-5 in 2004 when the study commenced, and the data is therefore from a previous era. The 2016 report provides comparative data for the cohort from 2004 to 2012, when the same children are aged 12-13. When aged 4-5, the parents reported their children watched an average of 119 minutes of television per day on weekdays and 131 minutes on weekends. In 2012, at age 12-13, this same cohort of infants was watching 116 minutes of television per weekday and 151 minutes on the weekend (AIFS, 2016: 106). The data also shows that in families with higher levels of education, children were less likely to watch television for more than two hours a day, especially on weekdays. As 4-5-year-olds, 42% of children whose parents were not university educated watched more than 2 hours of television per day, compared with 32% for children in families where a parent was university educated. In 2004, parents reported that their 4-5-year-old infants used home computers for an average of 14 minutes per day. 6.5% used computers for more than an hour per day on weekdays and 19 minutes on weekends (families were not asked about electronic game use). In 2012, the same cohort of children reported that they used electronic games or computers for an average of 88 minutes per day on weekdays and 107 minutes on weekends. The study shows that by age 12-13, the cohort was using screens for an average of about three hours on weekdays and four hours on weekends. A study conducted by the Australian Communications and Media Authority of 1,137 adult respondents with children aged 0-4 in 2015 suggests their children watch 114 minutes of free to air television per day, which is comparable to the 2004 study data (ACMA, 2015: 5). The ACMA study shows that 5-12-year-olds watched 80 minutes of free to air television per day and overall, youngsters aged 0-14 watched 33 minutes less per day of free to air television in 2013, compared to 2001, reflecting children’s engagement with digital technologies. The study also shows that 77% of parents said they time-restrict their kids television viewing and 99% of parents said it was important their children watch age appropriate programs (ACMA, 2015: 13). Coenen’s study of mobile device use (2015) surveyed Australian parents of 159 children aged 0-5 and showed that 62.1% of children watched television for more than 30 minutes per day on weekdays and 65.8% on weekends. The next most used devices were tablet computers, with 25.8% greater than 30 minutes use on weekdays and 31.3% on weekends. Hamilton and others (2015) conducted a small study of 20 parents of 2-5-year-olds to better understand parents’ views about physical activity and screen time. Parents in their study argued that limiting screen time promotes physical activity, improves mental wellbeing and stimulates creativity through play. Neumann’s study (2015) of the home digital environments of 69 2-4 year olds in Australia surveyed parents and found that the children used television for a mean time of 80 minutes per day, tablet computers for 20 minutes per day, mobiles phones for 10 minutes, the internet for about 8 minutes per day and games consoles for about 5 minutes per day. We are not presenting these ‘comparisons’ as scientific assessments, but rather as an opportunity to generate new lines of inquiry. Perhaps most interestingly, the findings suggest young Chinese children spend less time on screens on both weekdays and weekends than young children in Australia. Chinese children’s total screen time use per weekday is 63 minutes and on weekends is 88 minutes, while kids in Australia watch television for 114 minutes per day (ACMA, 2015), and use other devices in addition to this (Coenen & al., 2015, Neumann, 2015). It is interesting to consider explanations for this disparity. Firstly, children in China are involved in long hours of formal education at a younger age than Australian children, perhaps providing Australian children with more time to access screen media. Secondly, the Chinese results indicate that children with more siblings might spend more time on television which also increases the total screen time. As most Chinese young children (61.5%) are still the only child in their families, they may have less screen time than Australian children who generally grow up with siblings. Thirdly, we can speculate that children in China spend less time with digital media because of parents’ attitudes to the benefits and harms of media. While it is impossible to make direct comparisons about attitude from the available data, significant numbers of both Chinese and Australian parents believe it is important to be involved in their children’s media use through playing a gatekeeping role, and both have concerns about the possible harmful effects of screen time. Another surprising result of this study is Chinese parents’ emphasis on the educational functions of digital media, with most parents believing in the value of educational tablets for early education. While there is increasing emphasis on educational performance at younger ages in Australia, our sense is that there remains greater emphasis on educational achievement in China. There are some possible explanations for this that will benefit from further study. Firstly, there is a tradition for Chinese parents to attach importance to academic performance and employment, secondly, the one-child policy may have increased parents’ expectations on the only child, and they are willing to devote everything they can to enhance their children’s education. Thirdly, the growing competition in the labor market in China encourages parents to start children’s education as early as possible, to assist them to be competitive amongst their peers. Finally, commercial companies have foreseen the huge profit in the children’s early education market and vigorously advertise their products. Another significant observation from the two data sets that warrants further investigation is that there seems to be a similar amount of tablet and smartphone use by young children in China and Australia. Chinese parents report that 20.6% of children use tablet computers on weekdays and 28.5% on weekends, and 41% of kids use smartphones on weekdays and 50.3% on weekends. Of those that use them, the average time on tablets is 31 minutes on weekdays and 46 minutes on weekends; for smartphones, it is 22 minutes on weekdays and 25 minutes on weekends. In Australia, according to Coenen’s study, tablets are used more than 30 minutes a day by 25.8% of minors on weekdays and 31.3% on weekends. It is more difficult to make a comparison with smartphones with the available data, but only 38.7% of young Australian children never use a smartphone on weekdays, and 43.8% never use them on weekends. Therefore, in both countries, it seems that at least half of all minors use smartphones for up to 30 minutes on the weekend and over a quarter use tablets for more than 30 minutes in both countries on the weekend. Another similarity between the two countries is the type of content children access, within the context of globalized cultural experiences of childhood. As Appadurai (1996) suggests, mediascapes and ideoscapes are two closely related dimensions of global culture flows. In Australia, the Australian Broadcasting Corporation (ABC) is by far the most popular provider of children’s media content (ACMA, 2015), broadcasting and digitally distributing content internationally. In China, while Channel 14 from China Central Television broadcasts 20 hours a day and carries Chinese children’s cartoons, it also broadcasts many popular international children’s programs that are also available to Australian children on the ABC: Teletubbies, Peppa Pig, Thomas the Tank Engine and so on. These productions are introduced to both Chinese and Australian youngsters and their parents along with Western knowledge, norms, and values, and then become part of their childhoods. Although there are some differences between young Chinese and Australian children’s everyday digital media experiences, there are also signs that global flows of entertainment and information are bringing their ‘Eastern’ and ‘Western’ experiences of childhood closer together. There are some obvious limitations to this study, and this restricts the extent to which findings may generate new theories or explanations. It focuses on childhood and digital media use in urban China, but there are still huge gaps between urban and rural districts in China including in economic development, family routine, culture, and technology consumption. Likewise, the limited nature of the data from Australia makes it difficult to speak with confidence about young Australian children’s experiences of digital media, especially across a range of socio-economic and geographic circumstances. The real benefit we have seen in bringing these disparate studies together is to generate new research questions. While this article has aimed to move scholarship towards a better understanding of digital childhoods in China and Australia, a great deal is still to be learnt about the complexities of young children’s ever-evolving digital media experiences. 1 The “Annual Report on Development of China’s Radio, Film, and Television” suggests the proportion of digital television users in a city like Shanghai could be as high as 91.74%. Thus, television in this research mainly refers to digital television. 2 Early educational tablets include devices similar to the LeapFrog system found in Western countries. In China, the system is called the “Early Education Machine” (direct translation). 3 Short for reference. Comparing male and female screen time and nominal variables are converted to dummy variables to use linear regression to compare the differences between groups. The coefficient number for television is 46”, meaning males watch television for 0.46 minutes more than females. Holloway, D., Green, L., & Livingstone, S. (2013). Zero to eight: Young children and their Internet use. LSE, London: EU Kids Online. (https://goo.gl/MNAAPT).